Dale Hey saved our first trip in our caravan after our original choice let us down at last minute. Turned out to be for the best as this is an excellent site. Very clean and tidy and well laid out. We had a choice of very good hard standing pitches, with picturesque views all around. Toilet/shower block was also very clean and warm with all facilities. 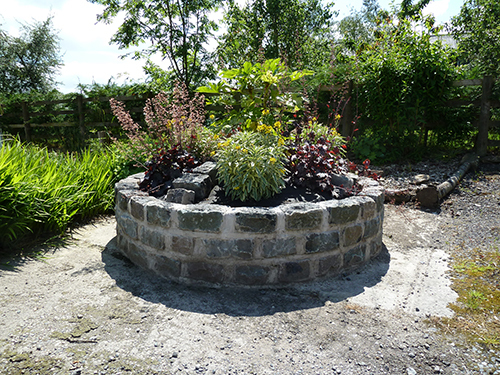 Ideal base for exploring area with forest of bowland on the doorstep. Clitheroe and Skipton are a short drive away and Ribchester, where we had a lovely meal at ‘Ribchester Arms’ a 15 minute walk. We are new to caravanning so we only stayed for one night to try out towing and using caravan. We got welcome reception from site owners and we would definitely return to this site for a longer stay. Just passing. We re-visited this site as we were nosey to see how much it had changed since we’d last called in five years ago. Delighted to see the amazing improvements. The location is fabulous! Facilities are great! The place is clean and tidy and quite enchanting! Lots of effort given over to environmental issues and to creating a slightly olde worlde curiosity. Nice! Good access, good value, and well run. The owner had time for a chat and was an entertaining character – so proud of his achievements and so ambitious to create the perfect holiday setting. We saw him handling minor issues with common sense and subtlety, a thing campers usually like to see. I recommend a visit. Wish I could guarantee good weather! Take your waterproof – we’ve seen this place sunny, but by golly it can be damp too! This was a very nicely kept site, both clean and tidy with a helpful and friendly welcome from the owners. The site is not over large and was a nice mix of camping and touring areas with a rally field also. Pitches for caravans were hard-standing and pretty level. On site was a nice short walk through the woods which was a great way of getting some air before bedtime with our three year old who enjoyed looking at the insects and trying to hunt out the deer! It is a very short drive into Ribchester which has some nice pubs and a spar shop. We visited the Roman museum which had some child friendly activities on at the time and the River Ribble was also lovely to walk along. 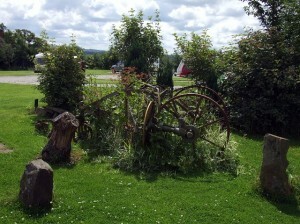 The site is very handy for a number of local attractions. We will most definitely consider another visit. Phoned on route to get in here as a brief stop heading south, and ended up staying a few nights. A great friendly welcome with advice of local attractions to suit the kids. We were given a choice of pitches which allowed us to decide which fitted our needs. A very tidy site with all caravan pitches being hard standing. The tent pitches looked great, allowing you to tuck yourself in designated areas that were very private and quite a distance from your neighbour. The dog walk, as others have suggested is not confined to dog walkers. In fact we allowed the kids to go wandering on this on their own with the 2 way radios and they loved it. You can walk into the village for a few pints in the pub (food looked good, but didn’t try it). Plus the advice to visit the play area was very much appreciated with the obligatory ice cream shop in the café opposite. Longridge was great for stocking up on supplies with a Butcher/Baker and a supermarket with a petrol station which also had the cheapest fuel in the area. We did go to the Wild Boar Farm nearby, which wasn’t as good as we were led to believe. It was quite pricey for what it was, although the Wild Boar Burgers were nice, and the ice cream was fantastic and cheap. The kids enjoyed the “death slides”, but sadly the go karts / tractors / ride on things were in a poor state so not much use to many kids at a time. Overall a nice site and one we will return to in the future. We arrived at the site to find the owners were away however the couple looking after the site were very helpful and nothing was too much trouble. We were on the Rally site. All the pitches are hard standing with grass for the awning most pitches are on a bit of a slope so blocks are needed to level the caravan. Fantastic views of the hills and we had a few walks around the wooded area. Every thing was clean tidy and well looked after. A place to return to We went to Clitheroe a great little place with interesting shops a castle and a market. Ribchester is small with some nice walks along the River Ribble and a small Roman museum. Excellent site! Would recommend this site to everyone! Where do I start! You are greeted by the owners who are polite and helpful and very cheerful. They are always happy to help with any problems. Pitches are excellent, really spacious and have plenty of room for awning and car, chairs, tables, barbecue’s etc. Pitches are hard standing and grass and are kept immaculate. Toilet facilities are excellent. They are cleaned daily and are always immaculate. Shower cubicles are very spacious and have separate sink area, there is a chair in each cubicle and hooks to hang clothes on. For dog lovers there is a fabulous dog walk area, which has various grass path ways which are mowed to allow you and your dog to follow it round. The grass pathways allows you to take the long walk round or you can come out at various parts which allows a shorter walk. It really is fabulous, and there are deer to be spotted (I saw two whilst walking my dog)!. Dog bins are provided throughout the dog walk and are emptied regularly, which I thought was really good. There is a stream if your dog likes a bath! Site has lovely views and is very peaceful, We stayed at the top of the site which is near the main road. People have stated that traffic is noisy! We stayed 2 weeks at the top of the site and had no problem with any noise, yes traffic passes by (well it is a road)! but this is definitely not a problem. I would and will happily stay at the top of the site. Ribchester village is 10-15mins walk, it has lovely pubs, and shops, it also has a social club which is very cheap and you can play snooker, staff at the club are really friendly. There is a Spar for any provisions you need. Longridge is approx 3 miles away and has lots of pubs and shops, cinema and Sainsburys. This really is a diamond of a site, which was recommended by friends. I plan to spend lots of time here throughout the years. It is excellent value for money. Just returned from an excellent weekend at this gorgeous site. It is immaculate, clean showers and stunning views. There are plenty of gravel hardstanding pitches, washing up area for tents, the tent field is really nice and there is a woodland walk from there. This site is fantastic for a relaxing weekend break and within walking distance of Ribchester where there is a local park/river/nice pubs. Highly recommend with very friendly site owners. Just spent 2 nights end of June at Dale Hey Farm. Tent with EHU. Advised by Catherine that they have just started allowing tents to pitch there, and we we shown to a large flat grassed area with room to park car at the side. Toilet/Shower block quite a walk away but they were clean, and included in the overall cost. Hot shower, although operated on push button, found if you leant on it from behind it kept a constant flow. Nice cubicles which included a separate sink area and seat & hooks for clothes and towels. An easy downhill walk to Ribchester with scenic walks around the surrounding areas. In the other direction towards Longridge, approx 3 miles away where there were more shops and pubs. We didn’t explore the area to it’s fullest, as only on a short break. Nice dog walk area (although we didn’t take our dog) which circumnavigated the site and a path was neatly mown out for the walker, whilst letting dogs go off exploring in the overgrown areas. Overall a very enjoyable weekend, with hospitable hosts, Catherine & John, who were there to give advice and assistance but not intrusive. This is an excellent site. The owners are very friendly and helpful. The site is immaculately maintained and I would have no problem recommending it. There is space for children to play (it there is no rally on there is a whole empty field). There are clear paths giving access to the woods and walks direct from the site so no need to use your car, always a bonus. It is a short walk into Ribchester and the local Spar shop, again no need to use the car. Fab site, thoroughly recommended. Very very impressed just returned after 3 nights stay. Owners really friendly, site and toilet block was immaculately clean. 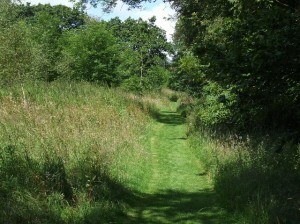 The dog walk is in a meadow that has multiple circular paths that are all pleasant walks. The site is surrounded by stunning views with all the hard standing pitches having 10amp electric hook up points and there are many other none electric pitches close to the rally field at the bottom of the site. The site also has a well presented seasonal pitch area. Ribchester is 15 minutes walk from the site and the village itself has a Roman museum and Roman baths as well as the beautiful river Ribble meandering through. Two pubs both are dog friendly and meals served at the Ribchester arms looked very nice though we didn’t eat there. There is also a local Spar combined with a post office for your daily essentials. Top quality site and for £12. 00 per night (midweek) it excellent value for money. Will return again. Fantastic site! Highly recommended. The owners are fabulous hosts! very friendly and helpful. The pitches are very spacious and have plenty of room for awning and car, with still plenty of room to sit out. 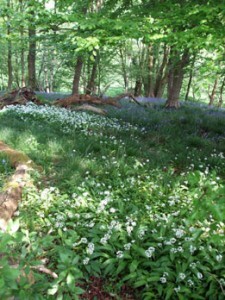 There is a fantastic dog walk which has mowed out pathways and dog bins are provided at various points throughout. The site has beautiful views. I stayed at the top of the site, which I have read in previous reviews that it is noisy due to traffic. Please take no notice of this, yes traffic passes by but it is not noisy and not noticeable!. Children have plenty of areas to play which means they are not running around the caravan. The toilet facilities are excellent and kept immaculate! and cleaned daily. Large shower cubicles with separate sink area, absolutely lovely, a credit to the owners. Ribchester village is approx. 15mins walk (no more than that) and has pubs and shops etc. There is a spar for purchasing food, drinks, etc. There is a social club which is really cheap £2 a pint! Longridge is approx. 3 miles in the opposite direction and has shops, pubs, Chinese takeaway, Indian, Italian etc. And even a cinema. I would highly recommend this site and plan to stay here a lot in the coming years. Fantastic site. What a jewel. Toilets/showers immaculate. Grounds very well kept. The dog/person (woodland) walk is a sight to behold. We saw two deer just walking our dog. Pitches level. Owners friendly and pleasant. Views exceptional. Woodland walk out of this world. Ribchester just 15 minutes walk. And what a find. Roman museum. Roman baths. Roman granaries. And to top it all – an exceptional view of the River Ribble. Dale Hey is a little jewel. We will be back. Just got back from this site. Although I have visited this site 4 times in the past this is my first review. The site is a rural position and has great view’s the shower block is very clean and spacious and is free. The site is dog friendly with a great dog walk, The owners are friendly but not intrusive, he is always busy doing something or other. Each time I have visited this site I can see improvement on the last visit, Ribchester is about 0. 5 mile down the road and Longridge about 4 miles. Super site. Nice, rural aspect with views across the valley and a picturesque brook at the bottom of the hill. We saw Deer among the trees on several occasions. Toilet block was clean & spacious. Some of the other tourers were regular customers, which is always a good sign. The road is close by but it didn’t bother us. We only came for the Open Golf in nearby Lytham St Annes so it’s not a part of the world I’m very familiar with but I would certainly use this site again. This was our first time in this area and what a fabulous little site. The facilities were spotless. We were told to pick a pitch and chose the last one by the little fenced off pond and we had fabulous views. There is a lovely little walk through all the trees. The site was so quiet and relaxing we were able to chill and recharge our batteries. We walked into Ribchester (about 15 minutes away) and followed the ‘historical tour’ from a leaflet obtained from the little cafe in the village. We walked into Longridge (wished we had cycled instead, a bit too far to walk for me!). 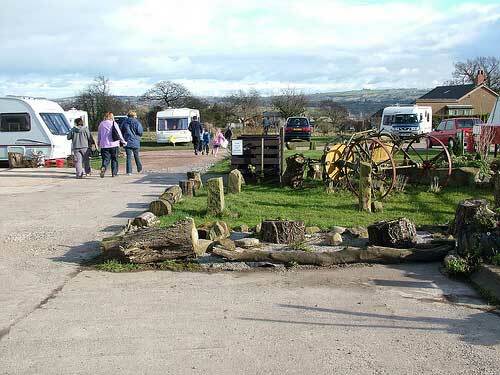 There is a very good supermarket and petrol station and a few interesting shops at Longridge. This is a gem of a site, lovely friendly owners and very reasonably priced. Would certainly recommend it. Just arrived home from second stay to this site, The greeting at barrier to being shown which pitch we could have and a little chat telling us where things are, John makes you more than welcome. Met Cath the next night cleaning toilet block at 8pm, No closing of facilities here. The site on a whole cannot be faulted, and with John and Cath living next door, always a ear to bend if need be. Would recommend this site. Just spent a brilliant weekend at Dale Hey. We came with friends and we all enjoyed the site. The pitches are gravel hardstanding with grass for the awning. The showers and toilets are immaculate and the site is very well kept. It is an ideal location for Ribchester as its within walking distance and the pubs there are all dog and child friendly. The views from this site are stunning and its one of our favourite sites as its not too far away. The owners Catherine and John are very welcoming and we will be returning. This site is highly recommended. Just returned from a lovely weekend at Dale Hey Farm. 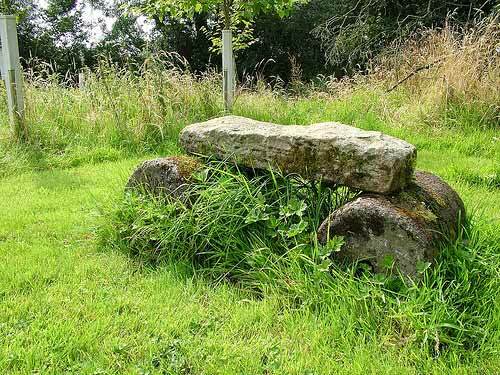 This is a really lovely site in the gorgeous area of Ribchester with stunning views. The site is very clean and tidy. The owners went out of their way to help in anyway they could. All the pitches are hard standing and the water pipe is very close by. There is not a play area, but we were there to celebrate a friends birthday so all the children just played in the surrounding fields and wooded area. (there is a stream at the end of the land – so be vigilant with little ones). There is a really good park less than a mile away – round the corner from the Spar. There’s the odd pub here and there but we didn’t call in. We used our own facilities but our friends said the showers/loos were really nice & clean. All in all, we would definitely recommend. Stayed 3 nights at this site, and I echo all the positive comments. Facilities are spotless and the site and pitches are well kept. There is a Spar in Ribchester for essentials and as said previously, a couple of good pubs for refreshments. Blackpool and the coast are within easy reach, and John and Catherine are always willing to offer advice on places to visit. Despite the weather we had a good relaxing stay and would recommend to anyone. Stayed two nights here with our friends and our dog, what a beautiful site, the owner was a really friendly guy, and always had time for a chat, he was up early tending to the grass, pitches and rockeries, the site is very well kept, and nice big pitches. The toilet block is immaculate, I think it is brand new, fabulous hot power showers, with a separate cubicle with a chair to put your clothes on, then another separate cubicle with a sink in, all contained within your own shower room, never seen a shower block so spotless as this. Will definitely be coming back here again, highly recommend you give it a try if you are in that neck of the woods. Reviewer: Samandlee Date of Visit: April 2012 Unit: Touring Caravan As others have said, well kept site, with friendly attentive owners. The dog walk is fantastic, we saw deer, rabbits and lots of birds, with lots of strategically place bins so it was immaculate- Clearly a lot of thought has been put into this. We have 3 small children, who enjoyed the space and wildlife, and who could all come to the shower (with mum) at once. The shower rooms have 3 small sections so it was easy to keep dry things dry whilst excited children are in the shower. What a great design, and always immaculately clean, the loos had nice touches too like air freshener. Lots to see & do in Ribble Valley, and Catherine even scoured the local paper for us to see what was on locally. Rock pegs essential for awnings, and the ground is boggy when its raining, although it drains very well. We’ll be back – would love to see a swing or slide! A lovely location – great views of the surrounding hills and run by a friendly and helpful couple with a lot of experience of camping themselves. The site is well spaced/ organised and there is a programme of continuous improvement with planting of shrubs and enhancement to the facilities. It was very cold weather but the toilet/shower facilities were warm and well equipped. 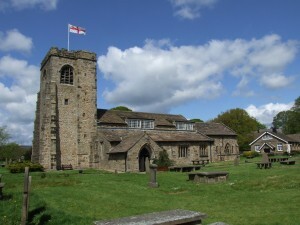 Ribchester the nearby historic town is a 20 minute downhill walk or quick 2 minute bus ride back up. Ribchester offers 3 pubs and a walking trail to follow! It was our first real outing in the motorhome and it was an enjoyable all round experience. Reviewer: Welshrover Date of Visit: December 2011 Unit: Touring Caravan Just returned from a 3 night stay at this caravan park and what pleasure it was to stop at such rural site without been isolated. The site is spick and spam and as I been here a few times the owner always seem to make alterations and its getting better all the time, four new hardstands being constructed. New tile floor in the ladies a new length of a lovely timber fence, and from what I gather a solar panel on the roof of the toilet block, extra trees planted and the grass always close cropped. The views over Pendle hill are fantastic. Ribchester is walking distance with pubs and shops and Longridge is five minutes drive by car. If anyone is looking for a nice quiet decent site which is rural without being isolated try this one you wont be disappointed its a little gem. Reviewer: Cheryl, mark Date of Visit: August 2011 Unit: Touring Caravan Just returned from a very enoyable weekend away at Dale Hey Farm. There were 7 families all with caravans and we all had a great time. The site is very well laid out and all pitches are on hardstanding. The showers and toilets are really nice and large each has their own sink and a chair, there’s plenty of room if you have young children. This site is within walking distance of Ribchester which has a great kids park and local pubs are friendly and allow dogs and children. The views are stunning over the Ribble Valley. The owners are very friendly and make you welcome, they are making this site into a top site and they are continuously looking for ways to improve it and work is ongoing with its expansion. I would recommend this site to anyone who is looking for a good location and relaxing break away, yet close to lovely villages in the Ribble Valley. We will be returning to this lovely site in the not too distant future as they only close for a short period and reopen again in December for the year. Reviewer: Ognober Date of Visit: July 2011 Unit: Touring Caravan Visited site for the first time over the weekend and it lived up to expectations. It is quite easy to spot on the left as you approach Ribchester from Longridge. The owner is attentive when you arrive. She prefers you to pay cash but at £12 per night it was excellent value. The site is well laid out and although part is on a slope the touring caravan pitches are level. The toilet block was kept very clean and tidy with a good supply of toilet rolls and handwash is provided. The showers are the push button type but the water is hot and the pressure is good. The gents had two WCs’ and two showers and two wash basins (WHB) which seemed entirely adequate as there were never any queues. I understand that the ladies have individual rooms with shower, WC and (WHB) There is no potwash facility at the moment although one appears to be under construction. There are a number of different small walks into a wooded area accessed from the touring field which are ideal for those with dogs. The site does not have a shop (although Catherine was selling fresh plums) but there is a Spar in Ribchester a twenty minute walk away and Sainsburys in Longridge (with a cashpoint) a ten minute drive. The site does not have a designated child play area but the children we saw had plenty of space to run and enjoyed themselves. There are open views across the ribble Valley to Pendle Hill and Longridge fell can just be seen in the other direction. 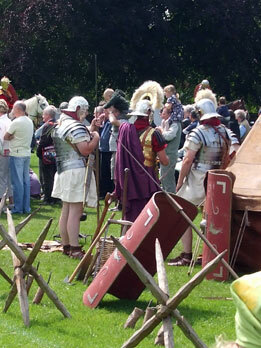 There are places of interest in the ‘Roman’ settlement of Ribchester and good walking around the site and in the area. We will return to this peaceful site. Reviewer: Freedom4us Date of Visit: July 2011 Unit: Touring Caravan We have been back again to this campsite as we had such a lovely time last time. Just had to warn fellow campers though that the traffic wardens in the village are very eager.We were just finishing a lovely meal in the White Bull when we realised we were slightly over our ticket time. My husband rushed back to the car and we had a ticket timed at 12mins after the ticket ran out my husband got back to the car 15mins after the ticket had run out so warned! Other than that the campsite is fab. The views are lovely and they now have an ice cream van calling, although we did not partake! John the site owner said that it was their intention to build a soil bank between the road and the site which would effectively eliminate the road noise. The other two parts of the site were not near the road and there was no discernible road noise.The site is well run, well managed by John and his family who go out of their way to be pleasant and helpful. The site fees £12.00 a night are very reasonable for the area. 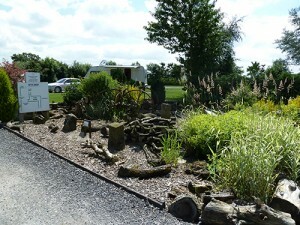 Reviewer: Matt norcliffe Date of Visit: June 2011 Unit: Touring Caravan A gem of a site, clean, tidy and well maintained. We stayed for a long weekend on a hard standing pitch over looking a forest and Pendle hill (stunning), for just £12 a night all in. Does slightly miss a playground for young ones to be amused but there is a great park in Ribchester itself. Very happy dog though with a fabulous dog walk that has plenty of bins, & different paths so you don’t get bored walking the same route. We have already booked for the August Bank Hol & at £12 a night great value! We had a lovely 3 day stay . What a stunning place with absolutely fantastic facilities which are kept in pristine condition. Will definately be back soon. We stayed here for 5 nights on our first ever caravan holiday. John, the owner, was very helpful and always there if we needed him. We were in the small 6 van field which was lovely with great views. This field is closest to the road but there wasn’t too much road noise. The site is very well kept, the shower block was always spotless and well stocked. There are 3 loos, one basin and 2 shower cubicles in the ladies and similar in the gents. The showers are free, the push-button type and there is a separate area with a chair and hooks for clothes and a wash basin in each cubicle. There are plenty of water points around the site, general waste and recycling bins and a small information board. There are no pot-washing facilities. The bottom of the site is planted with young trees and makes a very pleasant walk and a perfect dog-walk, with plenty of poo bins. It is a 15-20 minute walk downhill to Ribchester where there is a Spar and two pubs, both of which allow dogs in. We were recommended the Ribchester Arms and found the food to be very good quality and reasonably priced. Take a torch if you’re walking back in the dark as, although there is pavement all the way, the street lights stop about half way. The bus to Longridge and Clitheroe stops outside the site if you stick your arm out! If you’re travelling to the site from the M6, there is a rather hairy bend in Ribchester fine if nothing’s coming the other way but a bit nerve-wracking for us novices when we met a huge oncoming coach. We went back home the other way, through Longridge!All in all, we had a great holiday at a very reasonable price on a lovely site. We look forward to going back soon. 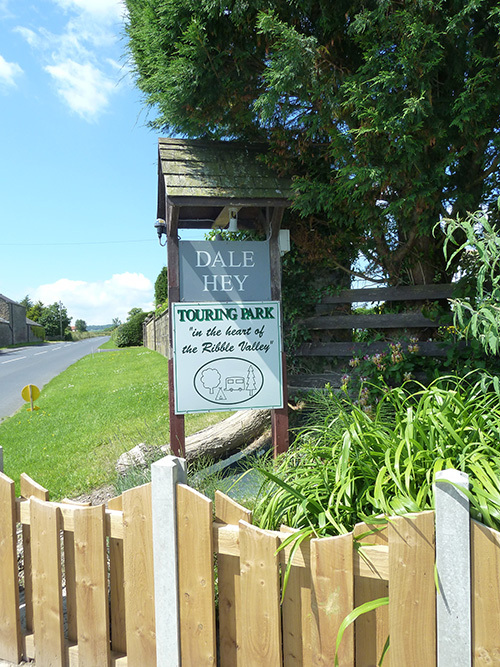 We had a lovely stay at Dale Hey; it was our first outing in our new (to us) caravan and John was very friendly and helpful and gave some good tips for walks and outings, and all things caravanning in general. The site was very peaceful with fantastic views, and the toilets and showers were excellent being very clean at every visit. Hi Catherine & John, We stayed at Dale Hey Farm and what a wonderful surprise. One of the best sites we have stayed on in 50 years of caravanning. Good large pitches, wonderful views, the most brilliant dog walks and spotless clean facilities…well done, we shall call again…. Thanks a lot….. Ann & Fred.